Due to guidelines set by our corporation, we are unable to go into our feeder elementary schools to recruit beginning musicians for band, orchestra and choir. This has required us to develop creative recruitment strategies that encourage students to participate in a beginner ensemble without being able to demonstrate or discuss the program with them during the school day. Our strategies include afternoon and evening activities for kids and parents and a structured timeline of targeted communications. We do a great deal of online and electronic communication with focused pages on our website geared toward recruitment. Due to the fact that signups are online, this eliminates the need for elementary teachers to collect papers or complete other administrative tasks. Online sign-up for instrument fittings. 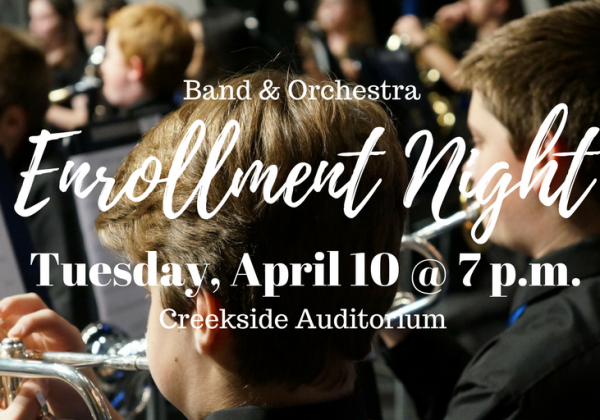 Evening Kid’s Concert for prospective students featuring the eighth grade band, orchestra, and choir to coincide with parent scheduling meeting at the middle school. Wristbands are given to every attending student with the school name and performing arts website URL. Prospective students and parents who will be entering our school next year. We make minor changes to the process each year based on feedback from elementary teachers and parents. The uploaded chart shows the enrollment growth of the Performing Arts programs at Creekside Middle School for the history of the school’s existence. The building opened in 2004 with 413 students total enrolled in band, orchestra and choir in grades 6-8. In the 2008-09 school year, the district eliminated our daytime recruitment concerts attended by all fifth graders from our feeder schools. New strategies put into place allowed our enrollment to continue to climb. School year 2010-11 was the last year that we were able to visit the elementary feeder programs to discuss the performing arts programs with prospective students. Again, we added new strategies for recruitment to our process and were able to continue to grow our numbers. The drop in enrollment that you see in 2015-2016 was the result of two factors out of our control. Redistricting moved approximately 30% of our school population to another middle school. In addition, a new program of studies was adopted which added several yearlong electives in World Language (for high school credit) and AVID as well as the adoption of a block schedule. These new electives mean that students in the eighth grade may not be able to fit performing arts into their schedule, which has also caused a decline in enrollment. First and foremost we encourage open dialogue with music educators from feeder programs. Streamlining the recruitment process helps to reduce the administrative burden for feeder teachers and allows them to simply promote your program.